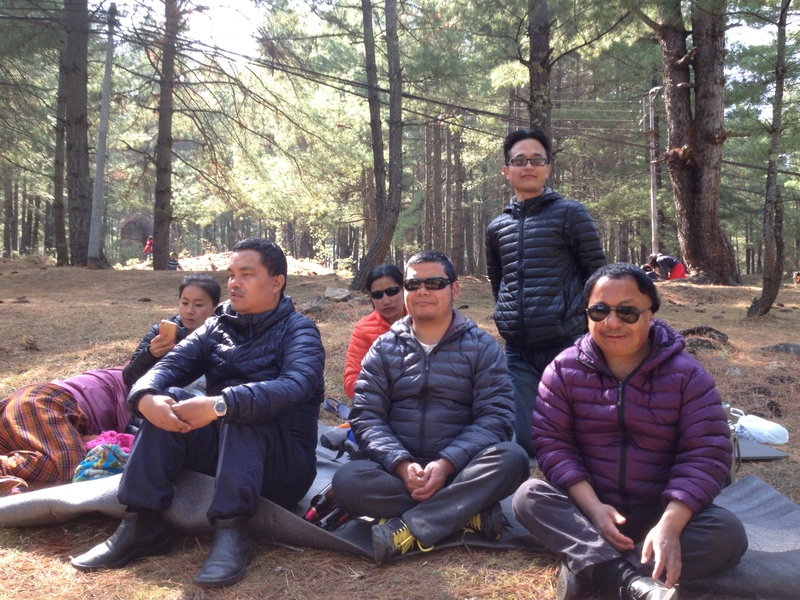 In order to celebrate the auspicious Dawa Dangpai Losar, I and some of my visually impaired friends got together and went to Paro with our families for a dry picnic today. It was a great occasion for all of us to have quality time together because in the hassle and bustle of busy urban life, social gatherings are becoming rare nowadays. It was also a wonderful opportunity for our kids to have outdoor fun together despite enjoying delicious foods brought by different people. We had planned this event since a couple of months ago and we had been looking forward to this big day for months. But the bad weather over the past couple of days caused some worries in us that we may not be able to execute our plans. However when the sun came up this morning, I knew we were finally on our way to Paro. My children were equally excited about it. My wife was quite worried because it would be her longest drive in our new car. She always said she may not be able to drive that far, but I was confident that she would do it. She started off with some reluctance but as we went on, she grew more confident. We had one car in front of us to guide us and the other car was to join us in Paro. In total, we had four families joining the picnic. 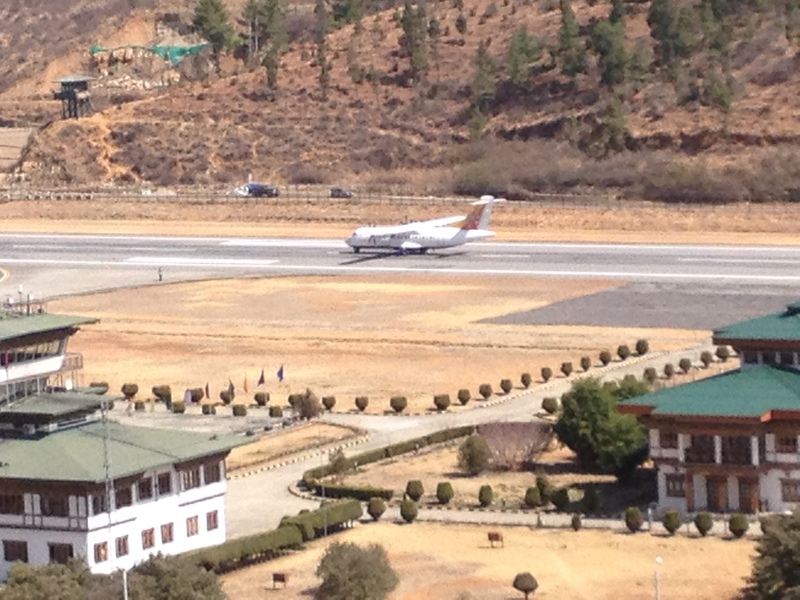 One of my friends suggested that we should stop at the Bird View Point at Khangkhu to let our children watch the flights taking off and landing at Paro International Airport. I thought it would be fun for the kids to see the aeroplanes at such a close proximity. So we stopped at the Bird View Point at Khangkhu and watched a number of flights taking off. As expected, all the kids were excited and had a lot of fun. Then we moved on to Lango where we were to be joined by the last member of our group. After meeting him and his family at Lango, we continued our drive towards Drugyel looking for a conducive picnic spot. Finally, we could find a nice ground surrounded by trees and woods, a perfect place to be with kids. We sat down and took rest for sometime chatting over a cup of tea while children enjoyed their own share of juice and snacks. We had a variety of tea: some had brought Suja while others had brought Ngaja. After the tea session, we had our lunch. With different food items from different households, it made up a very sumptuous lunch and we enjoyed every bit of it. Following the lunch, the kids went away to play while we sat in the sun enjoying beer and tea. Since one of my friends had to get back to Thimphu by evening, we had to cut short our fun and start our journey back. The kids had actually wanted more time to have fun in the wild because they don’t usually get the opportunity to experience such a thing in their life. On our way back, my wife agreed to drive without being guided. We let our friends go at their own pace since they were in hurry. She drove at her own convenience and slowly came our way, exploring the surrounding environment. Although she initially struggled with directions in the town, she gradually gained momentum and appeared more confident. We safely reached home at 4:30 pm. The weather favoured us throughout the day and we had a great moment together. I would like to thank my friends: Kuenga Dorji, Lhakpa Dorji and Santabir Rai, and their families for coming on board for such a wonderful get-together today. The beautiful memory we have created today shall remain in my heart forever. Wish you a very happy Losar!